Strap in, hold on, and Hulk out – because you’re in for a rollercoaster ride! 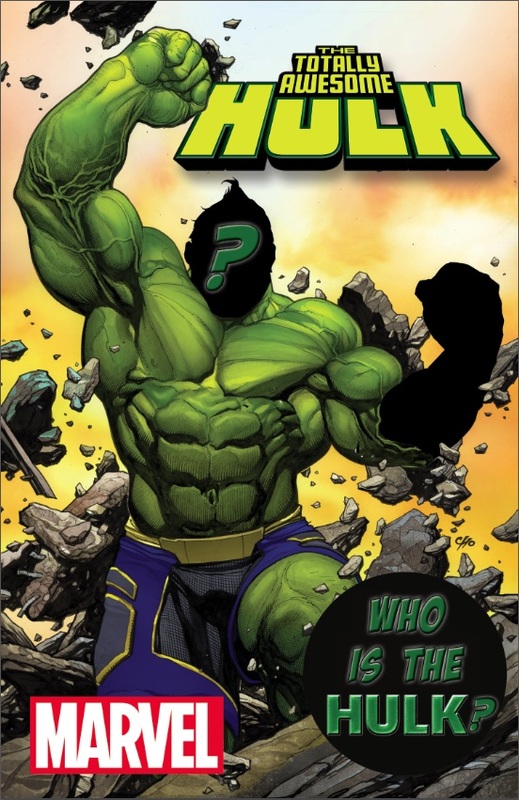 This Fall, Marvel proudly brings to you THE TOTALLY AWESOME HULK #1 – a brand-new ongoing series! We promise, True Believer – you’ve never seen a Hulk like this before! Legendary and storied Incredible Hulk scribe Greg Pak (Planet Hulk) returns to the green goliath’s ongoing adventures. And he’s bringing blockbuster artist Frank Cho (Mighty Avengers, Savage Wolverine) along for the ride! But who is this mysterious new Jade Giant? And just what has happened to Bruce Banner in the previous eight months? All will be revealed – and the answers will surprise you! Not tormented. Not conflicted. Just a giant green wrecking machine who loves being the Hulk. But will that spell trouble for the entire Marvel Universe? Big heart, big humor, high stakes and bombastic action await! Be there as this new Hulk’s exciting journey begins. It’s going to be TOTALLY AWESOME. Don’t miss the gamma explosion of epic proportions when THE TOTALLY AWESOME HULK #1 comes to comic shops and digital devices this Fall!